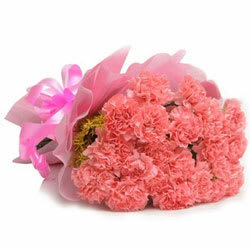 Convey your heartfelt wishes by gifting this Regal 15 Carnations Bouquet in Pink Colour to the people dearest to you. Pick this amazing Stylish 20 Carnations Arrangement in Pink Colour for the dearest people in your life to make them feel special and loved. Pick this amazing Stylish 25 Carnations Arrangement in Pink Colour for the dearest people in your life to make them feel special and loved.